The 66-year-old music icon decided to give up his jacket so Adele could keep warm after the London-born singer turned up to his outdoor show in Lisbon, Portugal last week wearing a skimpy dress. "I was a bit drunk, I'd had four glasses of wine, so I said I'd be fine." The 28-year-old singer said that rather than allowing her to freeze, Bruce decided to give up his own jacket for the duration of the show. She told the Daily Mirror newspaper: "He gave me his coat - so I was watching the show, wearing his coat. I was too embarrassed to try to put my arms in because, obviously, too small. So I just wore it on my shoulders. It was amazing." 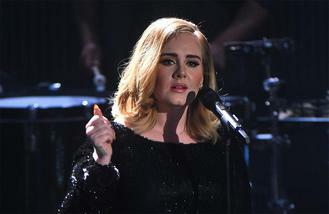 Meanwhile, it was recently reported that Adele is set to sign a new record deal worth an eye-watering £90 million. The chart-topping star is said to have been offered the astonishing deal by Sony, who will release her music worldwide. If the report comes to fruition, the pop superstar will top Robbie Williams, who was given £80 million by EMI Records in 2002. A Sony insider said: "We have secured the biggest music star in a generation. This is massive. "Adele's deal with her original label XL expired and we'd an existing relationship with her in America. "The deal is being worked on by our Columbia label in the US, but is worth £90 million and gives Sony the rights to release her future music exclusively around the world."